Until recently, most studies of the colonial period of the American West have focused on the activities and agency of men. Now, historian María Raquél Casas examines the role of Spanish-Mexican women in the development of California. She finds that, far from being pawns in a male-dominated society, Californianas of all classes were often active and determined creators of their own destinies, finding ways to choose their mates, to leave unsatisfactory marriages, and to maintain themselves economically. Using a wide range of sources in English and Spanish, Casas unveils a picture of women's lives in these critical decades of California's history. 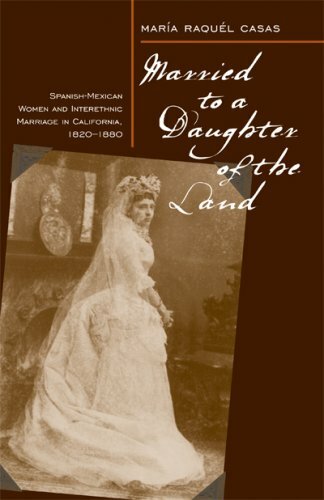 She shows how many Spanish-Mexican women negotiated the precarious boundaries of gender and race to choose Euro-American husbands, and what this intermarriage meant to the individuals involved and to the larger multiracial society evolving from California's rich Hispanic and Indian past. Casas's discussion ranges from California's burgeoning economy to the intimacies of private households and ethnically mixed families. Here we discover the actions of real women of all classes as they shaped their own identities. Married to a Daughter of the Land is a significant and fascinating contribution to the history of women in the American West and to our understanding of the complex role of gender, race, and class in the Borderlands of the Southwest. María Raquél Casas is an associate professor of history at the University of Nevada, Las Vegas. "This work provides the first comprehensive scholarly treatment of Mexican/EuroAmerican intermarriage in the Spanish borderlands. Casas convincingly challenges earlier studies that portrayed Spanish-speaking California women as helpless debutantes whose fathers used them to protect their own economic interests and social position." - Vicki L. Ruiz, University of California, Irvine"